I had to do it. The yarn looked so bad that I just couldn’t wait any longer to wash what I had knitted. It did even out just like I had hoped. The increases formed small holes before washing, but they’re all filled out now that they’ve been washed. Phew! I’m excited to continue on now, knowing that it’s going to look good when I’m done. BTW, I’ve started DVRing Knitty Gritty. It’s a little hoaky but there’s some good content in there too. A recent episode with Lily Chin was better than I had expected. 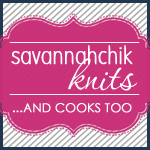 She shared a bunch of easy little tricks to help both new and experienced knitters. My favorite? To keep track of which needle you used to knit a swatch, knit the needle size into the swatch by knitting in as many eyelets as the needle size (US 5 needle, 5 eyelets in the first row). 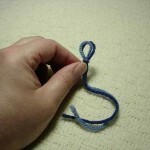 There are several other good tips too — like the one on how to deal with running out of yarn when doing a long tail cast on, and how to simply (and without math) determine how to space buttonholes evenly. Check it out if you have a few moments. also, nice job on the washed linen skirt! You moved so quickly on the knitted skirt! it is looking great. I will have to remember these posts when I get around to mine! I DVR Knitty Gritty, too, and used Lily’s cast-off with the crochet hook on my last pair of toe-up socks and it worked like a dream. The skirt looks great. Don’t you just love when things work out like they think you will? Glad that things evened out in the wash. Hmm, that IS a good tip. I DVR it also – not so much for the main story content, but for, like you said – the little tips here and there. I usually pick up one or two things an episode…. Glad the skirt worked out so far! You can breathe a sigh of relief! I TiVo Knitty Gritty too. I have quite a few saved up that I need to go through. I guess I should get on the bandwagon. The host kinda bugs me tho. That’s the only reason I didn’t volunteer to be one of the Knitty Gals or whatever they call them. Knitsters? Hmmm… Anyway, glad the skirt is working out. I just tried mine on last night, and it’s too big! I might copy you and give it a little dip to see if it will shrink up a little. Oh, now I try to remember to tie little knots in the end of the yarn to remember the size needle. 5 knots for 5 size, etc. Can’t do Knitty Gritty. 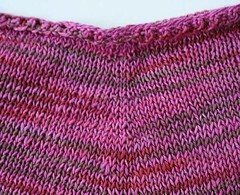 After an episode involving garter stitch scarves, in which the host kept gushing “How serendipitous!” I nearly barfed. I saw that Lily Chin episode a while ago and I’ve been doing my swatches like that ever since. I also liked her tip of hanging a swatch to dry with some weight added. After the stretching sleeves fiasco of last year I always check my gauge this way. No more surprises. The skirt came out wonderfully! And I agree about the show — the Lily Chin episode was the first one I saw so I T*vo’ed the season and was a bit disappointed in the others. My local cable area doesn’t offer the DIY channel so that was a major reason for getting rid of cable and just using the basic service. As a result I turn off the TV and get more quality knitting and organizing done. 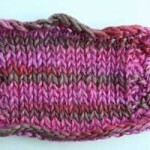 Sometimes I run across a pattern or list of knitting tricks on the internet based on the DIY knitting series. Thanks for offering some of what you picked up for those of us without access! Hey, Jody. Because of our past history of mysterious email problems, I just thought I’d tell you that I emailed you yesterday. What a relief. I would have done the same thing. It looks really good! I don’t get DIY, but thanks for the links. I love the colors that you chose for this. I have some blue moon sock yarn in the january one colorway that I’ve been considering using for a skirt. The feel of the colors is very similar. I think yours is going to look great. Plus the linen should hold up really well, which is essential when the point of wear is your backside! Good news re: linen. When you post pictures of the skirt-in-progress, I just get all distracted by how nicely it matches your blog. And oh, how I wish I got DIY! I love the colourway in the yarn. Looks great! 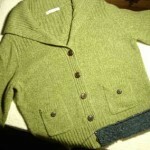 BTW, I emailed you back saying that of course you could link to my photo of the yarn to put on your blog. I’d be honoured! This tip about the swatch must be the best one I’ve ever heard/read – this is absolutely awesome! Thanks for sharing! I’m glad that the washing worked out the way you expected – the colors are so amazingly beautiful! Ooh, I’ve been thinking of doing this skirt with linen (Euroflax). Yours looks lovely in the Claudia Handpaint so far. And I was thinking of making it longer, so going from the top down would make more sense. And I agree with the Knitty Gritty hokiness, but I still DVR it to pick up tidbits. Wish we got DIY, so I could enjoy the new episodes.